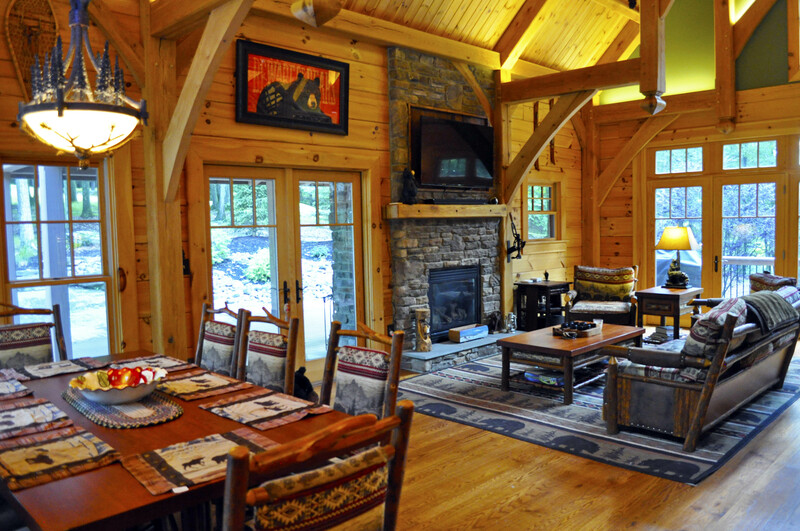 A spectacular timber frame home located next to the 6th tee on Paupack Hills Golf Club in the Tanglwood Lakes Community with beautiful views of the fairway and seasonal views of Lake Wallenpaupack. The magnificent craftsmanship and attention to detail is something to behold. This four season home offers three gas fireplaces and a 24-foot cathedral ceiling in the living room with expansive windows for maximum natural light. 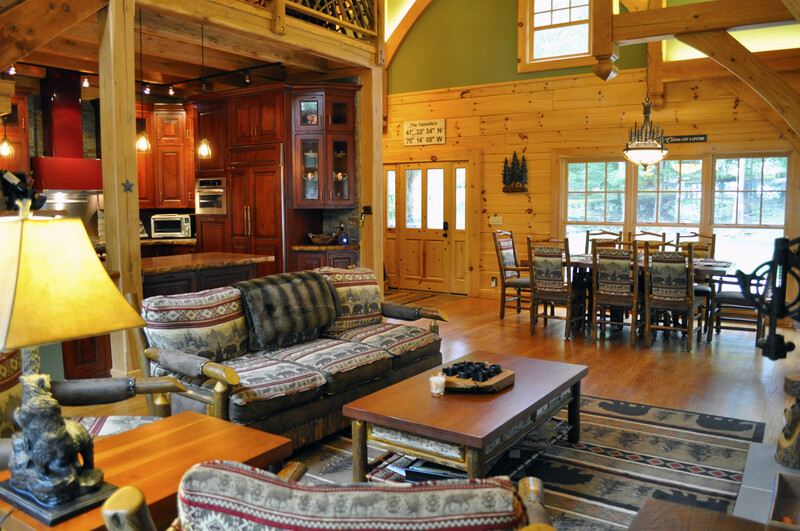 The home sleeps 12 privately and has ample room for any family or friend’s getaway. 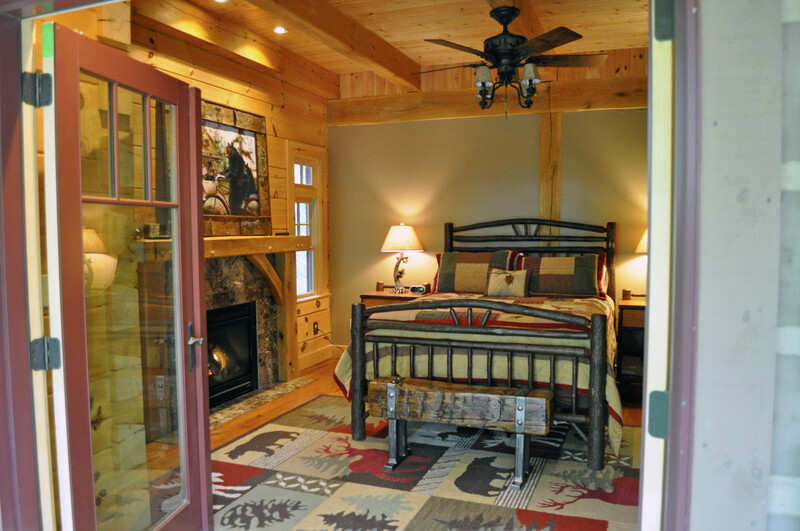 Enjoy the wood burning fireplace while gathering under the covered patio. 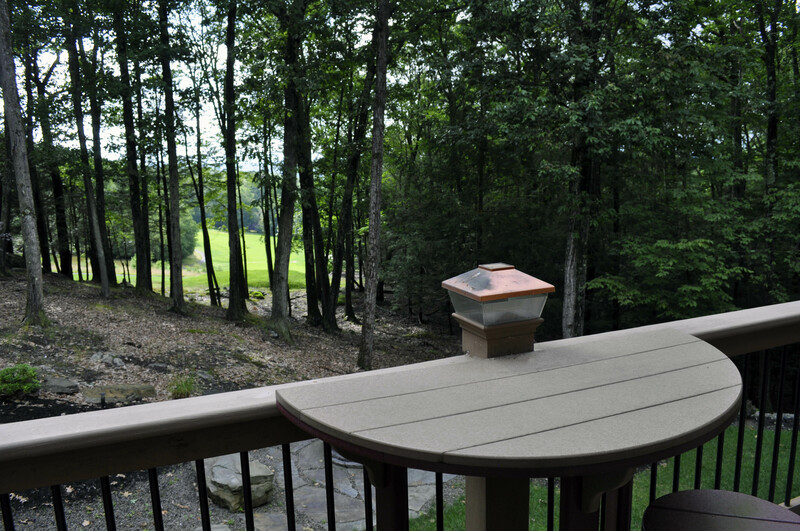 Watch the sunsets on the back deck overlooking the 6th fairway. 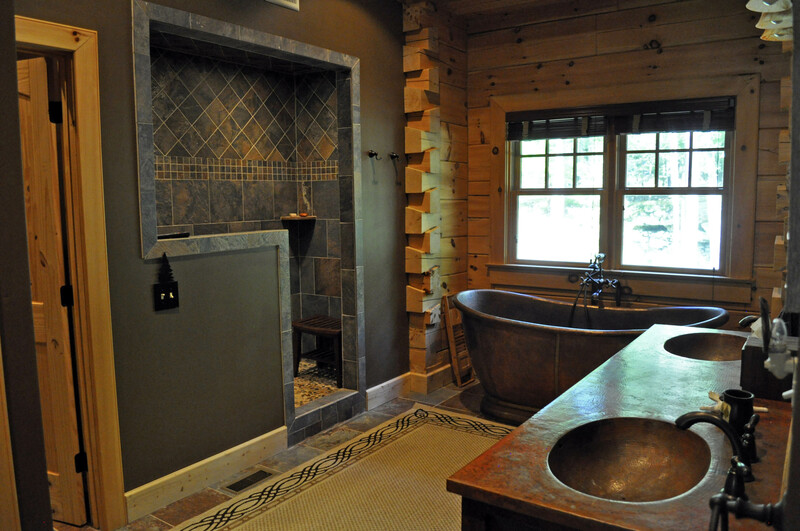 Everything is top of the line, from the high-end appliances in the chef’s kitchen to the 1st floor master suite that boasts a king sized log framed bed, gas fireplace and an elegant copper soaking tub; for the ultimate relaxing experience. 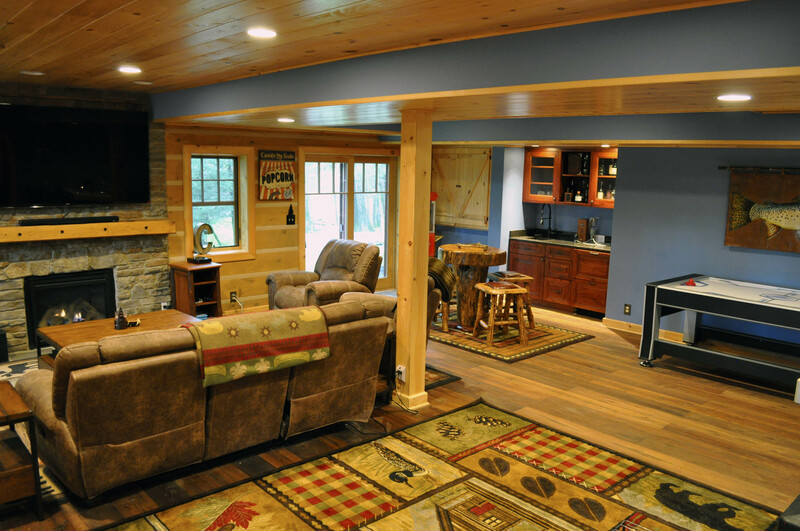 There are gas fireplaces in the living room and family room for those cold nights. The loft level has 2 bedrooms with a large bathroom and an expansive den/office area overlooking the living room with its 24-foot cathedral ceiling. 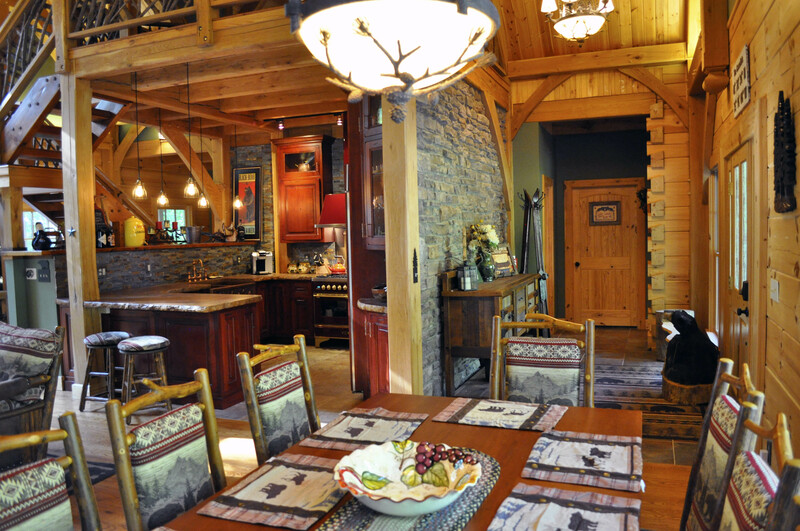 The main level of the house is an open concept living room with stone gas fireplace, dining area and fully equipped gourmet kitchen, the laundry room and master bedroom. 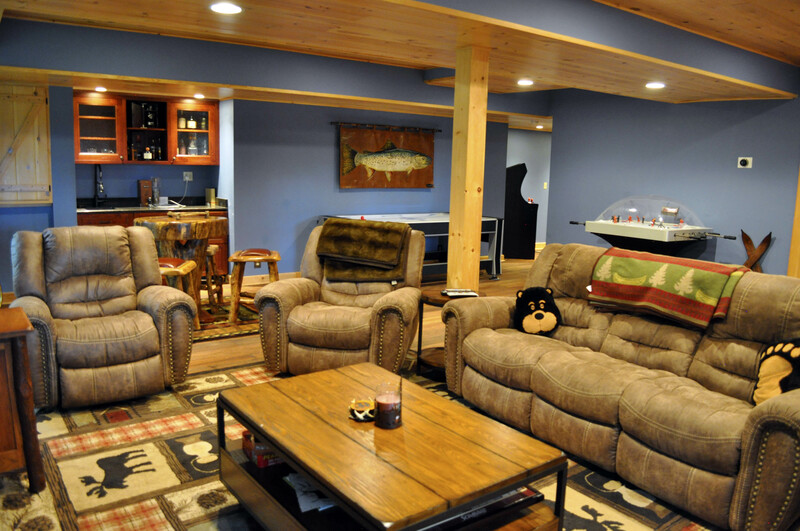 On the ground level is the Family Room with games, wet bar, bar table with chairs, comfortable recliners by the fireplace, a utility-mud room and the 2nd master bedroom with it’s own full bath . The dry sauna is located on this level. 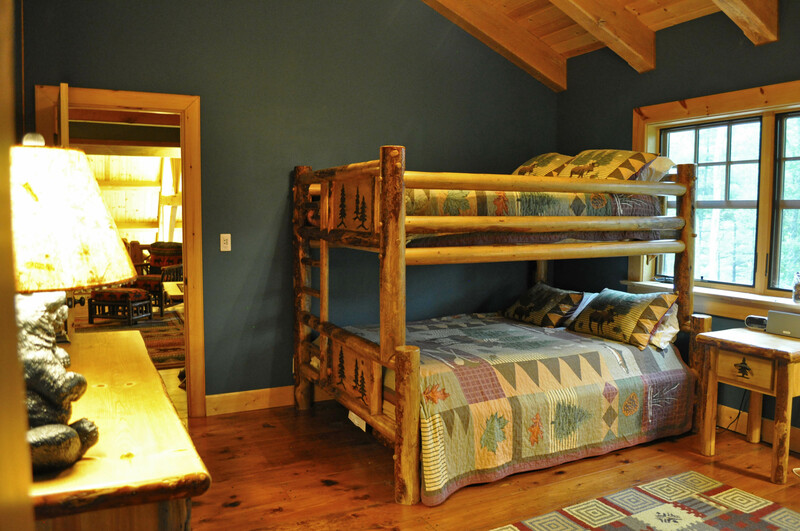 On the loft level of the house is a den/office area that overlooks the living room with a set of twin bunk beds, the two additional bedrooms and a shared bath. 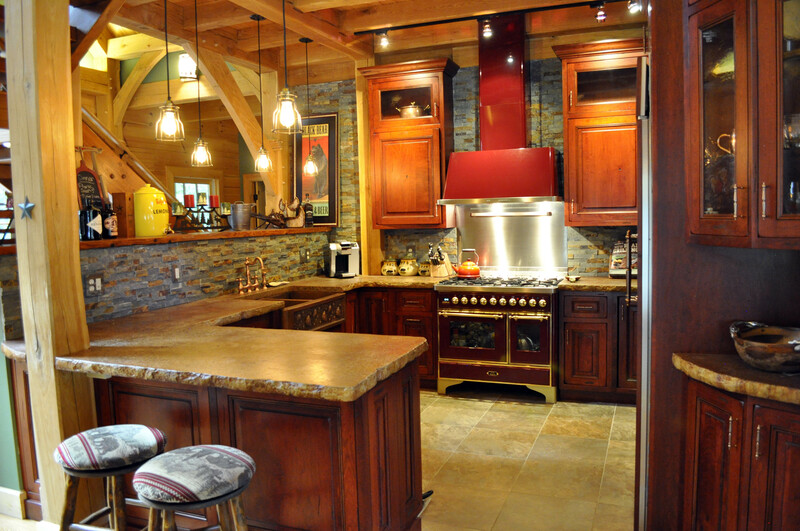 Kitchen includes: luxury Italian gas oven/range, sub-zero refrigerator, copper farmhouse style sink, dishwasher, microwave, all that is needed to create a gourmet meal. 4 Bedrooms & 3.5 Bathrooms; plus a loft area. Bedroom 1 – main level Master Suite w/King bed, master bath that includes walk-in shower with jets and an elegant copper soaking tub; Bedroom 2 is a king bedded room with it’s own bath and is located on the ground level. 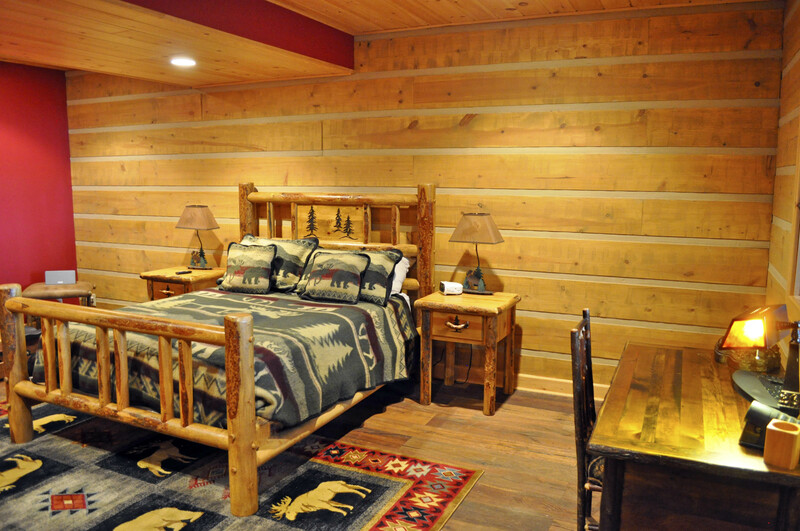 The loft level contains bedrooms 3 & 4 both have a twin over Queen Bed. 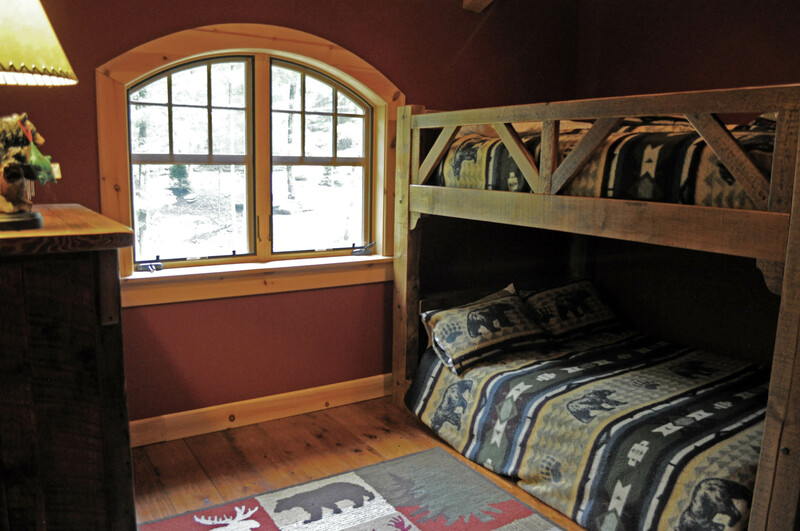 The loft area has a set of twin bunk beds in the open area. 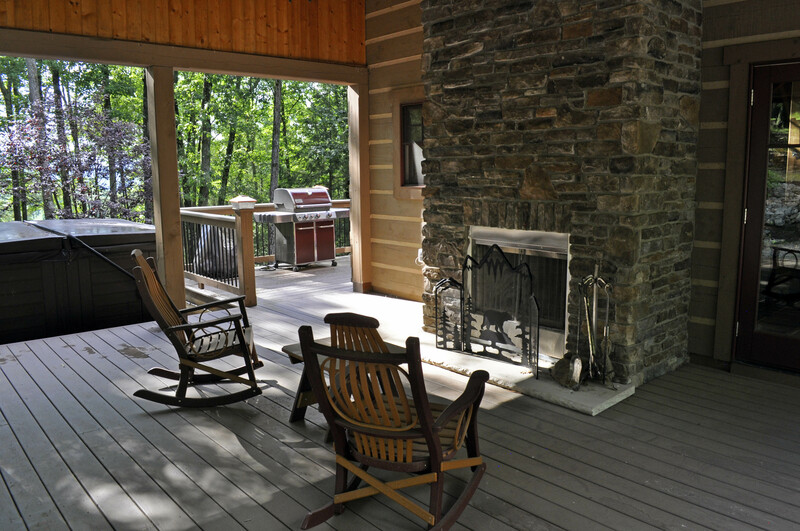 Enjoy full property privileges at Silver Birches Resort including: Pool, Shuffleboard, Playground & Lawn Games; The Settlers Inn Garden and River Area; and Ledges Hotel’s decks with views of Paupack High Falls. Your reservation will be secured with a deposit equal to 50% of the total cost of the reservation and the return of the signed rental agreement. The balance is due 30 days prior to arrival. If the booking is made within 30 days prior to arrival; the entire amount is due upon booking. 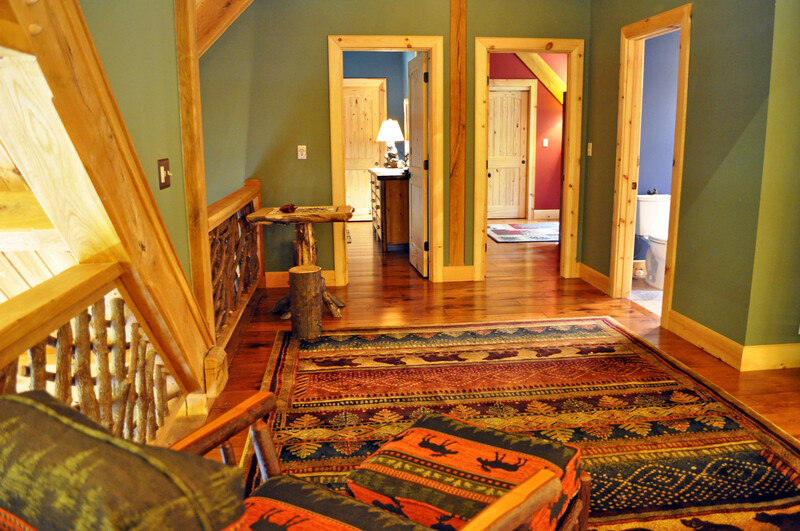 A $500 refundable security deposit will be required at check-in in case of damage to the property. If the pool is deemed unusable for the next guest a $500 charge for service will be charged to your credit card on file. The majority of tenants must be 25 years of age. This is a non-smoking/vaping property; strictly enforced. Non-compliance will result in a $500 cleaning fee. Intra-stay housekeeping available for a charge. Registration for your stay will be at Silver Birches Resort registration desk.